Welcome to this, the second edition in our Pharma Social Media Series, the UK Twitter Ranking. This ranking has been developed in partnership between Owen Health and firstlight PR. 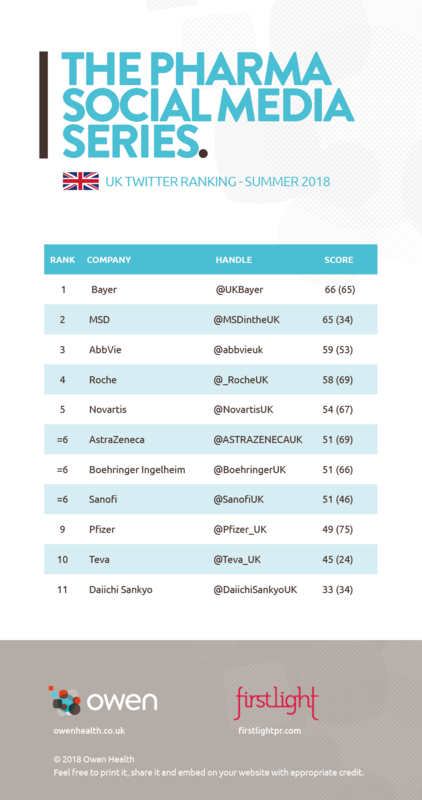 The ranking aims to take a snapshot of the performance of these pharma companies on Twitter in the UK and provide some commentary on our findings. Shining a light at the country level really starts to identify the challenges these pharma companies are facing with social media, namely commitment. The danger of zombie communities, as seen in our Global Twitter Ranking, is even more pronounced here. Pharma companies need to define a clear purpose for their UK Twitter presence and how it fits within their wider global Twitter strategy. Too many seem to struggle with their identify and purpose. Committing to a robust content marketing plan, which delivers relevant and distinctive content for their UK Twitter account is vital and can be done at scale and in a cost effective manner. Working smarter not harder is true when it comes to Twitter content. Without this they’re just playing lip service to social; at best missing opportunities and at worst damaging their corporate brand. We hope you enjoy the read and if you would like to learn more please feel free to get in touch. Liked this article? Please share it to help others find it. We’re Owen Health, a Healthcare Communications Agency that specialises in Multi-channel Marketing to make you Digitally Fitter, Stronger & Faster. If you sign up for our newsletter below, all our thoughts and ideas on healthcare communications will wing their way straight to your inbox without you having to lift a finger.